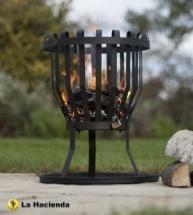 Fire basket ideal for burning logs on the patio. Made from steel coated with high temperature paint. Ideal for burning seasoned logs. Stay outside a little longer.